The Sydney Morning Herald reported that Graeme Colin Evans was convicted of manslaughter after he beat his parter so severely her skull gave way under his fists. She died as a result of the injuries he inflicted on her. The difference between murder and manslaughter is intent. Murder occurs when someone intends to kill another person. Manslaughter is where someone’s actions cause a death but the that was not the intention. This conviction means Evans cannot be described as a murderer. 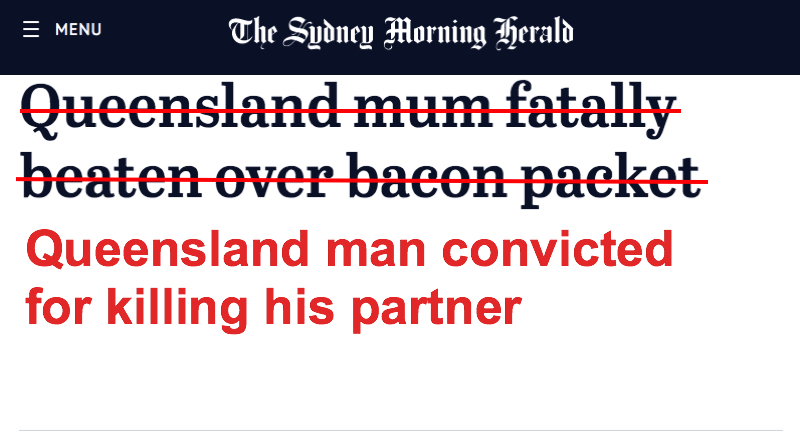 He did, however, kill his partner and it was not a “row over a bacon packet”. He beat his partner so violently that she died. Despite this, he is invisible in this headline. ← FixedIt: who are police looking for?